Shopping | Look. Like. Wear. Share. I love shoes, and, the more dramatic the better! As I get more comfortable stepping out of my fashion comfort zone, the more I love to invest in dramatic, statement piece shoes. I am loving the fact that loafers are making their comeback and this Tory Burch Jezebel Pump shoe does that trend in an unexpected way. 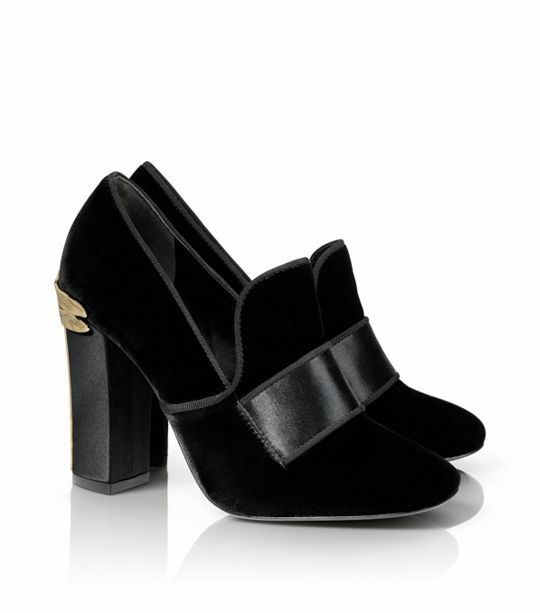 The sturdiness of the heel coupled with the rich velvet texture makes this a definite talking point in an outfit. 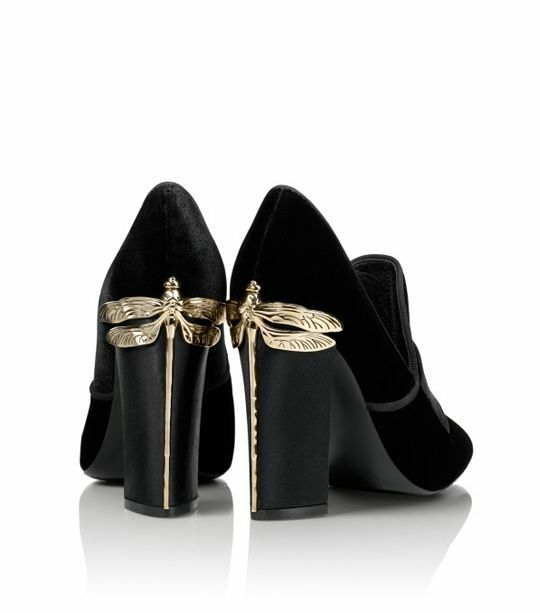 As if that isn’t enough, this shoe has a dragonfly, a symbol of good luck, wrapped around its satin-covered heel. For a retail price of $375, I wouldn’t mind splurging on these to both spice up my outfit and my closet! I have been searching for the perfect pair of oxfords ever since the weather started changing. A pair that is comfortable enough to walk around the city in all day yet still look stylish and chic enough to wear out to a movie or dinner date. I looked everywhere, high and low, but had no luck finding a pair that looked nice on my not-so-small feet and that wouldn’t kill my budget. Finally, about two months ago I found the perfect pair of oxfords; ones that would look great worn casually with a pair of jeans or dressed up with a skirt or dress. 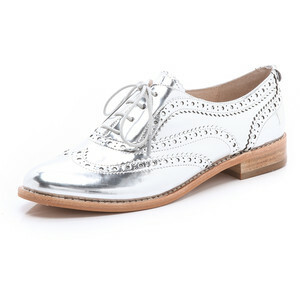 When I found these Sam Edelman Jerome Oxfords I instantly fell in love for both its style and price. Even better, I snagged them for a discounted price of $90 on shopbop during one of their amazing sales! Sam Edelman makes these oxfords in a few different colors and styles (here and here). Maybe I’ll purchase another pair when they go on sale. My thoughts on kitten heels were as follows: never wear them! That is until I came across these Salvatore Ferragamo Vara heels. My weakness for shoes with bows blossomed when I saw these. The style of these shoes look like something that Jackie O would be rocking; sophistication coupled with style. To top it off, not only are you able to design your own shoe by picking out the material, color and hardware but you can also get your initials engraved on the sole of it. Talk about custom made! I would love to wear these to work with skirts and dresses that cut above the knee as well as with ankle-length pants. As much as I love my stilettos, sometimes you just want to be both stylish and comfortable! My personally designed shoe would look like the ones in this picture; bisque colored shoe with an optic white bow and heel and glove hardware. They make a neutral outfit look so beautiful and feminine but at the same time would fit right in with a bold-colored one as well. For a price of $550, this would definitely have to be a splurge of the month for me! How would you design your shoe? When it comes to denim jeans I am more of a ‘splurger’ than a ‘saver,’ primarily because it is an item of clothing that I wear most often and keep in my closet for a long period of time. Having said that, I never pay full price for them. Last summer this changed when I was introduced to J. Crew’s toothpick jean and instantly fell in love. The fit, cut and color of the jean blinded me into paying full price for them. To this day, I still consider them to be one of my favorite pair of jeans and one of my best purchases. This weekend, during my ‘no-shopping phase,’ I happened to wonder into a J. Crew store and, by force of the saleswomen and my friend, I purchased another pair of toothpick jeans (these), but this time in a pattern; a trend that I am loving right now! Because of the insane sale in the store, I ended up getting the jeans for under $50! Just like with the previous pair, I made sure to purchase them two sizes smaller than my actual size as they do run a bit big and stretch a little. There were easily 2-3 other colors and washes that I wanted to purchase, but decided to save those for another day (during my ‘yes shopping phase.’) I cannot wait to rock my new jeans with a chambray shirt and a pair of heels or oxfords. I’ve said it before and I’ll say it again, I cannot live without my maxi dresses and skirts! When I came across this Versace Tie Dyed Georgette Long Dress from the Spring 2013 collection, I instantly fell in love with it. Versace took the boho look of a maxi dress from past seasons and gave it a more gothic/victorian feel by adding cut out shoulders and side panels, flared sleeves and a detachable leather belt. I love adding sharp and unexpected pieces to an otherwise feminine outfit, which is what Versace did with this dress by adding leather and metal fringing to a silk georgette bodice and skirt. An unusual combination that works beautifully together. With its long slit at the hem and other skin-baring sections, this dress is bound to have all eyes on it when worn out. A definite A+ for Versace! You can find the entire Versace Spring 2013 collection here. As much as I love playing around with costume jewelry, sometimes I enjoy putting on jewelry that has a bit more substance and that is a bit pricier (by default). As much as I would love to be able to purchase an unlimited amount of diamonds, that is not an option for me (yet). A few years ago, I came across Alexis Bittar jewelry at my local Nordstrom store and absolutely fell in love with his entire line. All of his pieces are unique; nothing that I have seen done by anyone before. Although his prices can be a bit steep, you can often find his items on sale at Nordstrom and Shopbop. My most recent Alexis Bittar purchase were these ‘Miss Havisham – New Wave’ Kit earrings. I had some money left over on a gift card and decided to splurge on these. 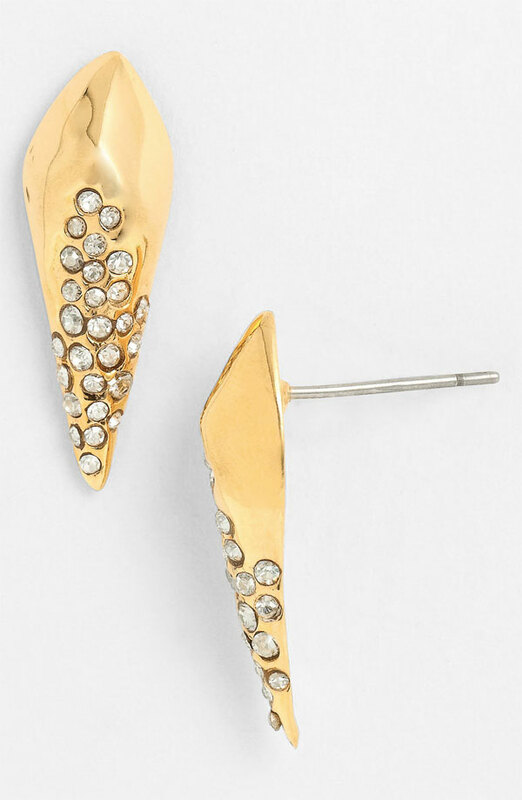 I love these earrings because of their versatility. I can wear them casually on the weekends, professionally to work, and dressy for a night out. I look forward to expanding my Alexis Bittar collection! 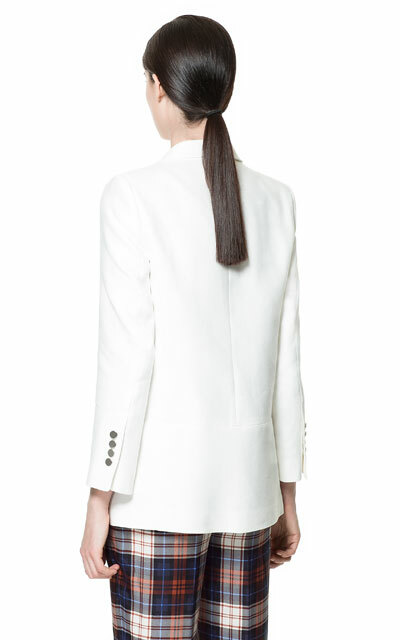 I have been looking for the perfect white blazer for about a year now and am proud to say that I have found it. All that looking and searching has paid off thanks to Zara. There are certain items of clothing that I love buying there, and blazers are definitely number one on that list. 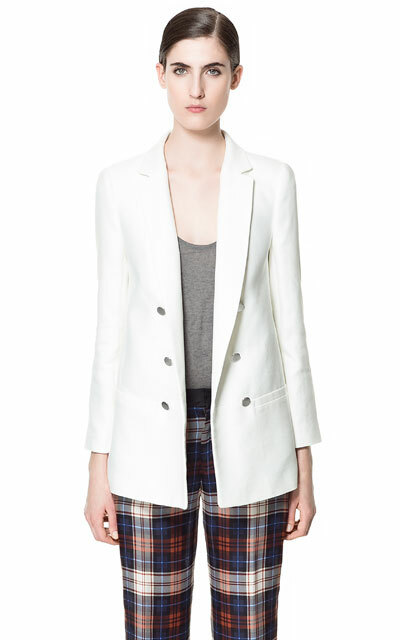 Their blazer prices are a bit high, but in my opinion, are worth the price as they do last a while. 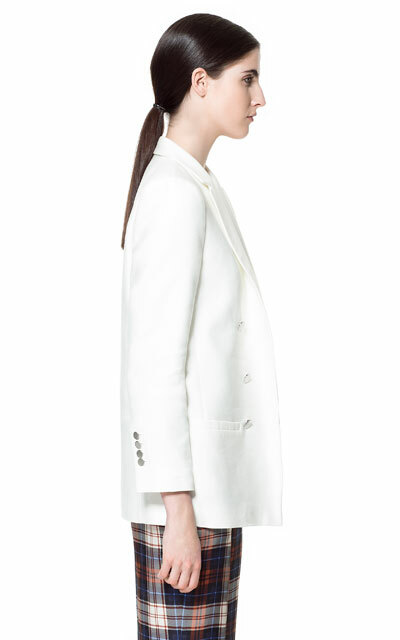 My new Zara blazer is perfect because it is oversized and long; two things that I am currently loving. I could see myself rocking it with a pair of boyfriend jeans or even a pair of shorts. For a price of $129, I will absolutely get my moneys worth this Spring, Summer and Fall.